The HMCA was founded to assist families as they cope with the homicide of a loved one. It is designed to provide sensitivity and support to the families of homicide victims, to rebuild and strengthen relationships between the Police Department and the community and to reduce the likelihood of retaliation. The HMCA was founded in 2009 and is a collaboration among the Police Department’s Homicide Division, church leaders in the St. Louis area and other community groups. The HMCA is offered as a resource for family members of homicide victims and participation on their part is voluntary. Investigators will continue to work with family members to solve homicides regardless of participation in the program. 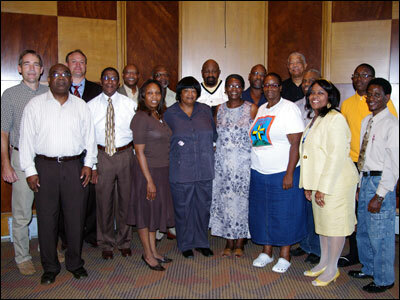 The HMCA ministers serve the Police Department in a completely voluntary capacity. The individual ministers and program coordinator give of their time as a service to the people of St. Louis. When investigators learn of a homicide committed in the City of St. Louis, the Police Department’s Homicide Division alerts the HMCA Director who then contacts the on-call minister. The on-call minister will make contact with the victim’s family within 48 hours. The minister remains a source of support to the family in the hours immediately following the homicide, through the funeral process and may continue to assist the family for up to one year following the homicide. One of the primary goals of the program is to encourage those close to the victim to avoid retaliating against those individuals who could be responsible for the crime. HMCA ministers work with families in order to mitigate any future crimes. In cases where family members of victims may be prone to retaliation, the HMCA provides guidance and support and encourages these individuals to make different choices. The HMCA also encourages those close to the victim to cooperate with police during the investigation. Homicide Detectives often struggle to find witnesses who are willing to come forward with information about a particular crime. The HMCA works to strengthen ties between the Police Department and members of the community in order to avoid these problems. HMCA ministers encourage family members to assist police not only in the homicide investigation involving their loved one but to always come forward when they have information about problems or crimes in their neighborhoods.